Starwood Preferred Guest (SPG) has loaded a new promotion on their Dashboard where eligible members can earn 500 Starpoints for a completed Cash & Points stay until September 11th. 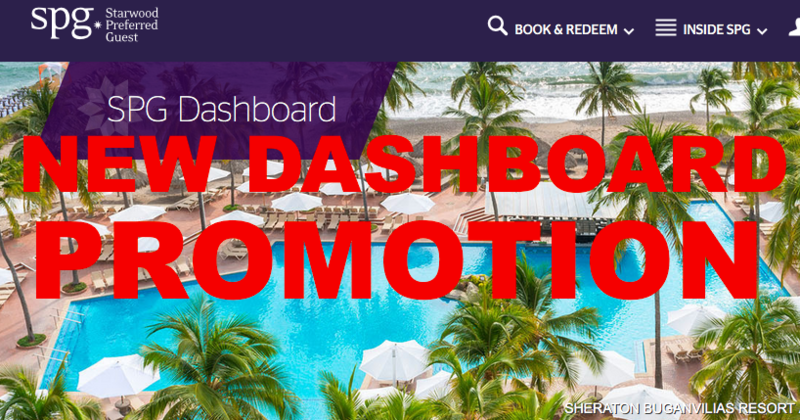 Starwood frequently uploads special promotions (including targeted ones) to the Dashboard which is supposed to help members keep better track of all SPG related things. I’m always keeping a close eye on my SPG Dashboard as it shows a variety of information such as lifetime status details, UBER earning and also current specials like the current 11 Brands Promotion (we wrote about it here). Their newest promotion is a (one time) 500 points bonus for a cash and points booking that has to be completed by September 11th 2016. The terms and conditions read as if the promotion if targeted. See if you qualify for this offer by checking your SPG Dashboard here. If you plan a SPG Award stay until then it might be a good idea to check if you can collect the extra 500 Starpoints as a small bonus. It’s probably not worth to make a stay just for this small promotion unless you know that you’ll be short on stays towards the end of the year. These promotions pop up from time to time so it’s always recommended to monitor the Dashboard as there is usually no separate email in regards to the earning opportunities. We always try to update our readers on all ongoing promotions so you can also sign up for the daily LoyaltyLobby email on the right hand side of this article. The Starwood Preferred Guest® (SPG®) program offers an exclusive bonus-earning activity to members when they are signed in to the SPG Dashboard and they meet the eligibility criteria. An eligible member can earn bonus Starpoints® for completing an activity during a limited earning window. Eligibility criteria and earn window vary by offer. A member can only earn a bonus once for each completed offer activity within its earning window. The offers are nontransferable and may expire at any time. An eligible member can earn 500 bonus Starpoints by booking and completing a qualifying stay using Cash & Points by Sep-11-2016. Cash & Points is offered at participating properties only, and in select room types. A list of participating properties and Cash & Points terms and conditions can be found here. Bonus Starpoints will be awarded within two to four (2 to 4) weeks after confirmation that the member completed his or her stay booked and paid for using Cash & Points by Sep-11-2016. Earning opportunities through the SPG Dashboard are subject to the Starwood Preferred Guest program terms and conditions, which are subject to change without notice and can be found at spg.com. Offer is applicable to individual members only and not to groups. Not responsible for omissions or typographical errors. 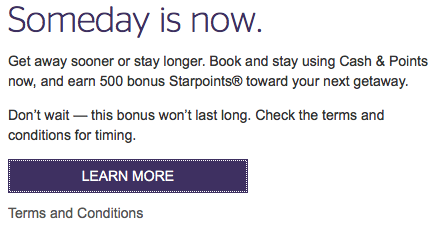 Starwood reserves the right to discontinue this offer at any time. To update your communication preferences or learn about our privacy practices, view our Privacy Statement on spg.com/privacy, or access our privacy information line by calling 1-877-782-0071 in the U.S. and Canada or +353-21-4930474 in all other countries.